Homelement announced their "Shop Everywhere" campaign to take advantage of dwindling summer days ahead. 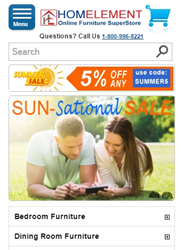 Instead of spending hours driving from one furniture store to another, customers can simply browse thousands of furniture and home decor online via Homelement's mobile site. Homelement announced their "Shop Everywhere" campaign to take advantage of dwindling summer days ahead. Homelement encouraged their customers to spend as much time outside to enjoy the remaining days of summer and do the furniture shopping online with their mobile phone. Instead of spending hours driving from one furniture store to another, customers can simply browse thousands of furniture and home decor online via Homelement's mobile site. Although the mobile site features detailed images of the furniture, it is designed to load quickly with intuitive navigation and easy checkout process. While Homelement main site is designed as a responsive site which adjust to various screen sizes, the mobile site is built differently to work around the large image requirement for the desktop site. By building the mobile site separately, Homelement also make sure that the design of the mobile site is geared specifically toward mobile size screen and can be loaded quickly over cell phone connection if WiFi connection is not available. Homelement.com is a leading retail supplier of home furnishings with more than a dozen years of industry experience. Homelement offers a complete selection of home furniture from major furniture brands in various categories from dining furniture, bedroom furniture to living room furniture and more.